satire » POP! goes The Vegan. This entry was posted on Monday, January 4th, 2010 at 5:56 pm and is filed under Film, Television. You can follow any responses to this entry through the RSS 2.0 feed. You can leave a response, or trackback from your own site. Stephen Colbert weighs in on Shark Week. Okay, that’s it. 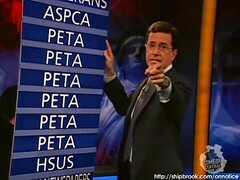 I’m now convinced that there’s a vegan, vegetarian or animal advocate of some stripe on The Colbert Report payroll. This segment is just too spot on to have been written by an unrepentant speciesist. 1 – Sensationalist predator programming like “Shark Week” perpetuates the myth that many wild-living animals, including sharks, are dangerous creatures who are out to get us. They are to be feared – and also dominated, conquered and killed. It’s “us or them,” right? 2 – The Discovery Channel is doubly irresponsible in its demonization of species which are largely endangered. 4 – Humans pose a much greater threat to other humans than do sharks. In fact, humans pose the greatest threat to all life. We’re the ultimate monsters, yo. 5 – Mainstream media: FAIL. This entry was posted on Saturday, August 8th, 2009 at 5:52 pm and is filed under Television. You can follow any responses to this entry through the RSS 2.0 feed. You can leave a response, or trackback from your own site. About twenty seconds into the video, my husband popped up over my shoulder to ask if I was watching an actual commercial. Such is the depravity of modern “meat” advertisements. All the outs and ins of making a great chicken. This entry was posted on Thursday, June 18th, 2009 at 11:11 am and is filed under Television. You can follow any responses to this entry through the RSS 2.0 feed. You can leave a response, or trackback from your own site.